This snack has all the bases covered. San Francisco is known for its unique craft cocktails and creative bar snacks, which is one of the reasons I love living here. One evening after work, I went to a wine bar near my office for happy hour called Press Club and ordered a popcorn mix that was to die for. It was so good, it inspired me to up my snack game from standard chips and dip to something more creative and a bit healthier, which is why I created this recipe. 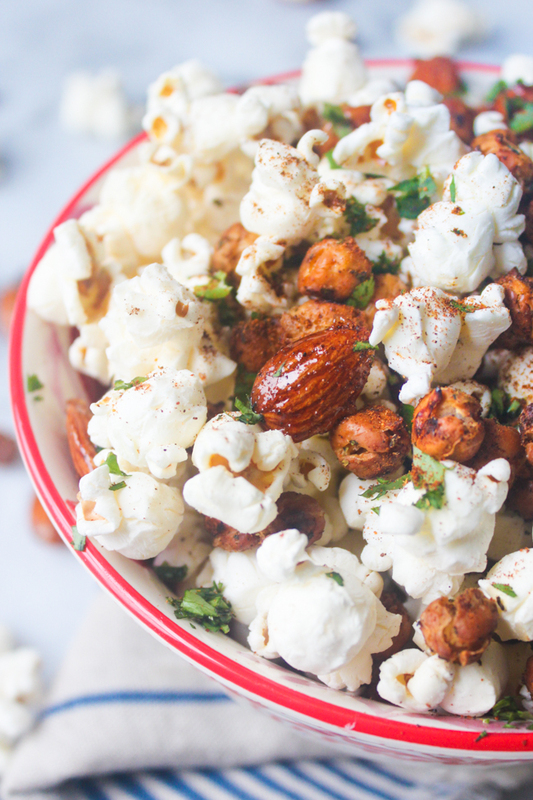 The spicy chili and cilantro roasted chickpeas, sweet honey and sea salt almonds, and salty popcorn all mixed together create the most delicious combination of flavors with so much satisfying crunch. I love this snack not only because it's so delicious, but also for the way it can amp up any average night at home. With so many amazing bars and restaurants just steps away from my apartment, it can be tempting to go out every time I want a drink or bit to eat, but there's something so special about putting in just a bit more effort to create that dining experience in my own home that I love even more than going out sometimes. 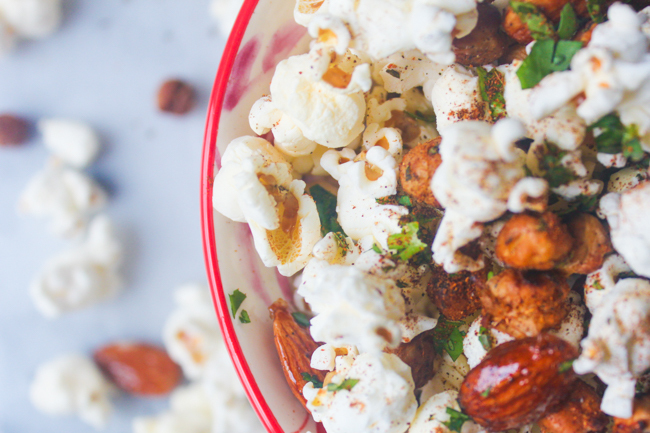 This is the perfect snack to pair with homemade cocktails, whip up for movie night, or make for watching football games, including the Super Bowl coming up, to make the whole experience feel that much more special and fun. - For the chickpeas: Preheat oven to 425 degrees. 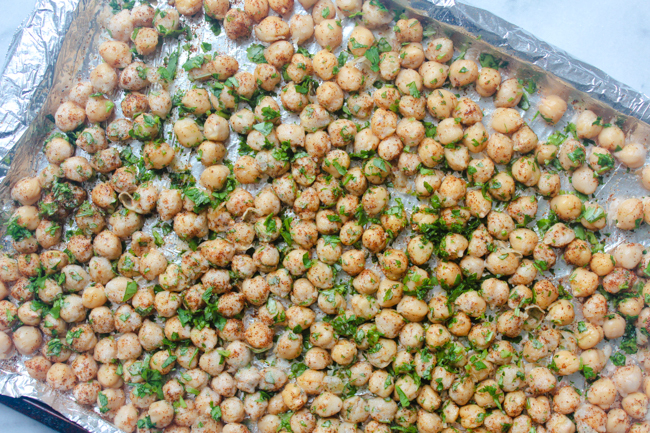 Cover a baking sheet with aluminum foil and spread chickpeas out in a single layer. Lightly spray with olive oil or drizzle with a small amount of olive oil and stir to coat. It is very important to not use too much olive oil here or they won't crisp up, that's why I like using the olive oil spray to just get a light coating (I use the one from Trader Joe's). Sprinkle with chili powder, cilantro, salt and pepper. Bake in oven until golden brown and crisp, about 30 - 40 minutes. - For the almonds: Heat honey in a large frying pan over medium low until it thins, about 3 minutes. Add almonds to pan, stir to coat, and sprinkle with sea salt. Stir continuously until fragrant, about 5 minutes. 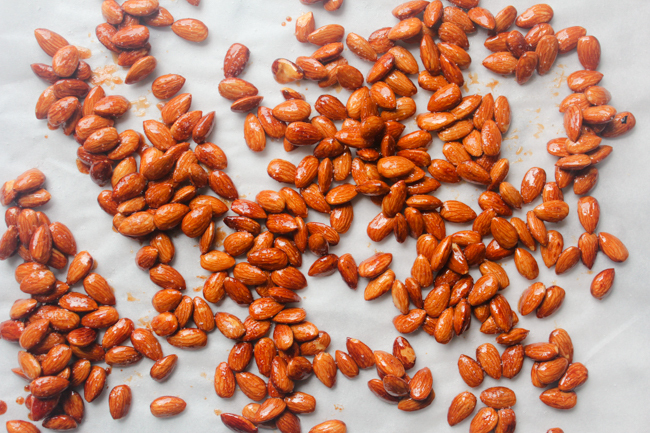 Lay almonds out on parchment paper in a single layer and sprinkle again with sea salt. 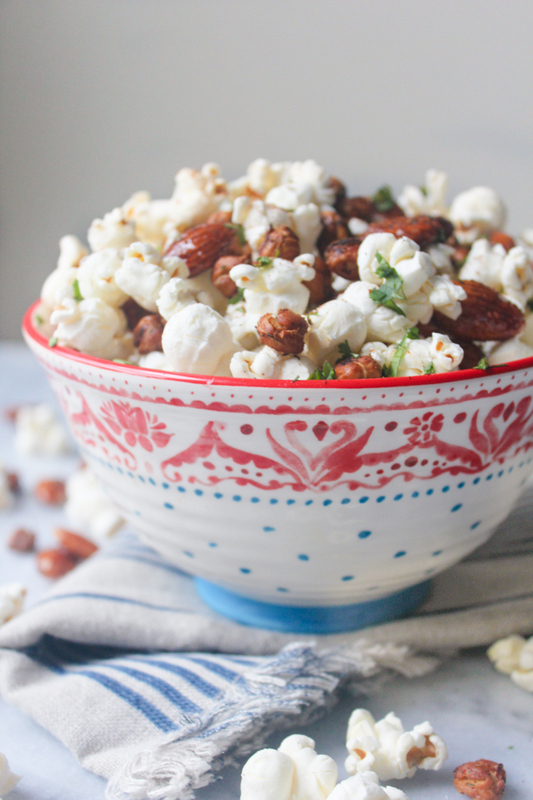 - Once the almonds have cooled completely and the chickpeas are done, mix both together with popcorn, finishing with a sprinkle of chili powder and cilantro. Thank you so much! I've been making this snack for a while and love it so much so I couldn't wait to share! Wow!! Looks so yummy!! I want to taste this!! This looks SO good! Perfect for Netflix and Chill days, haha.